“Non-violent grassroots actions by Israelis and Palestinians need support if they are to succeed and grow.”Julia Bacha, filmmaker and Media Director at Just Vision, blogs about their new short film series telling the stories of Israelis and Palestinians involved in an ongoing non-violent campaign in Sheikh Jarrah, Jerusalem. Two weeks ago, I screened Just Vision's newest short film series for the Elders when they met in my hometown of Rio de Janeiro. As a filmmaker, it is a rare and thrilling opportunity to have some of the world’s most inspiring and thoughtful leaders assembled in one room as an audience. It is even more moving when you know that the subject of your work is one they have been firmly focused on for some time. The series I showed, Home Front: Portraits from Sheikh Jarrah, is made up of several video portraits telling the stories of Israelis and Palestinians involved in an ongoing nonviolent campaign in East Jerusalem. This movement emerged in response to evictions of Palestinian residents of the Sheikh Jarrah neighbourhood by Israeli settlers. My colleagues and I at Just Vision decided to partner with Director Rebekah Wingert-Jabi in creating Home Front to address the repeated questions we received while touring with our previous film, Budrus: Are there any contemporary examples of Israelis and Palestinians engaging in nonviolence, and if so, do these efforts ever take place in Jerusalem, at the heart of the conflict? This wasn’t the first time the Elders had seen or heard about Sheikh Jarrah. In October 2010 several of them visited the neighbourhood and took part in one of the weekly peaceful protests. It was a powerful display of moral support, and it generated media attention and crucial encouragement for those fighting for their homes and the scores of supporters who had joined their struggle. The positive impact of the Elders’ visit underlines a principle that guides our work at Just Vision: that civilian-led nonviolent movements need attention and support if they are to succeed and grow. Pragmatic grassroots actions by Palestinians and Israelis have the capacity to radically change the toxic dynamics of this conflict. But for that to happen, we need to take notice and acknowledge that such efforts are taking place practically every day. Earlier this year, I spoke at TEDGlobal about the pivotal role that our attention plays in encouraging or discouraging nonviolence. While many commentators and policymakers express their desire to see a peaceful, unarmed movement emerge, when these initiatives do emerge they are often written off as too small or inconsequential. Instead of recognising and applauding these courageous efforts of Israelis and Palestinians, most people simply ignore them, reinforcing the false and dangerous belief that real change can only come from the top-down, or through violence. The recent rapid spread of popular movements throughout the Middle East and beyond, and the personal stories of many of the Elders themselves, should be reason enough to give pause to anyone relying on this shaky assumption. Again and again, we’ve seen entire societies transformed not through the actions of governments or armed forces, but through the deeds of ordinary civilians, who with the power of their example inspire hundreds of thousands of their peers to action. There is no reason this same process can’t help move Israelis and Palestinians out of the current stalemate and towards a better future. But for that to happen, all of us need to take the Elders’ lead, and make sure that we are devoting our time and attention to those who deserve it most. Julia Bacha is an award-winning filmmaker and Media Director at Just Vision. She directed and produced the critically-acclaimed documentary, Budrus, and most recently, wrote and produced the series Home Front: Portraits from Sheikh Jarrah. Views expressed are those of the author and do not necessarily represent those of The Elders or The Elders Foundation. 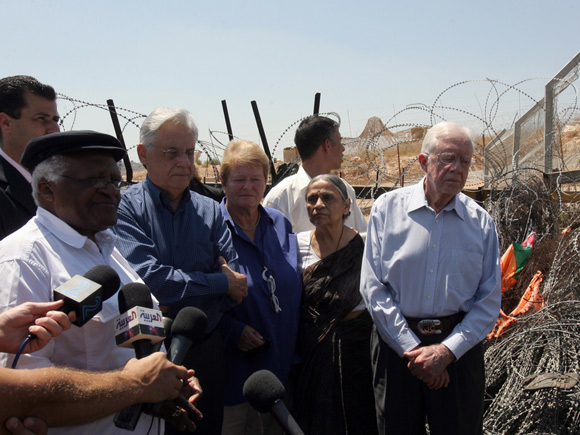 During their second visit to the Middle East in October 2010, the Elders travelled to East Jerusalem to see first-hand the extent of settlement expansion into Arab neighbourhoods.